The National Collegiate Athletic Association (NCAA) is a voluntary association of about 1,281 institutions, conferences, organizations and individuals that organizes the athletic programs of many colleges and universities in the United States and Canada . Its headquarters are located in Indianapolis , Indiana , and was under the leadership of president Myles Brand until his death on September 16, 2009 from pancreatic cancer. In August 1973, the current three-division setup of Division I, Division II, and Division III was adopted by the NCAA membership in a special convention. Under NCAA rules, Division I and Division II schools can offer scholarships to athletes for playing a sport. Division III schools may not offer any athletic scholarships. Generally, larger schools compete in Division I and smaller schools in II and III. Division I football was further divided into I-A and I-AA in 1978. Subsequently the term "Division I-AAA" was added to delineate Division I schools which do not field a football program at all. In 2006, Divisions I-A and I-AA were respectively renamed the Football Bowl Subdivision (FBS) and Football Championship Subdivision (FCS). The NCAA's predecessor, the Intercollegiate Athletic Association of the United States (IAAUS), was established on March 31, 1906 to set rules for amateur sports in the United States . When then-president Theodore Roosevelt's own son, Ted, broke his collar bone playing football at Harvard , Roosevelt became aware of the growing number of serious injuries and deaths occurring in collegiate football. He brought the presidents of five major institutions, Army , Navy , Harvard, Princeton , and Yale to several meetings at the White House in October 1905 to discuss steps to make college athletics safer. The IAAUS was created as an outcome of those meetings and became the National Collegiate Athletic Association in 1910. The modern era of the NCAA began in July 1952 when its executive director, Kansas City, Missouri native Walter Byers, moved the organization's headquarters from the LaSalle Hotel in Chicago (where its offices were shared by the headquarters of the Big Ten Conference) to the Fairmount Building at 101 West 11th Street in Downtown Kansas City. The move was intended to separate the NCAA from direct influence of any individual conference and to keep it centrally located. The Fairfax was a block from Municipal Auditorium which had hosted Final Four games in 1940, 1941 and 1942. After Byers moved to Kansas City, the championships would be held in Municipal in 1953, 1954, 1955, 1957, 1961, 1964. The Fairfax office consisted of three rooms with no air conditioning. Byers' staff consisted of four people (an assistant, two secretaries and a bookkeeper). In 1964 it moved three blocks away to offices in the Midland Theatre . In 1973 it moved to 6229 Nall at Southwest Trafficway in suburban Mission, Kansas in a $1.2 million building on 3.4 acres. The NCAA was dissatisfied with its Johnson County, Kansas suburban location noting that its location on the south edges of the Kansas City suburbs was more than 40 minutes from Kansas City International Airport . They also noted that the suburban location was not drawing visitors to its new visitors' centre. In 1997 it asked for bids for a new headquarters. Kansas City proposed to relocate the NCAA back downtown near the Crown Center complex and would locate the visitors' centre in Union Station . However Kansas City's main sports venue Kemper Arena was nearly 30 years old. Further the 50,000-seat RCA Dome far eclipsed the 17,000-seat Kemper. In 1999 the NCAA moved its 300 member staff to its new headquarters in the White River State Park in a four-story, facility on the west edge of downtown Indianapolis, Indiana . Adjacent to the headquarters is the NCAA Hall of Champions . By the 1980s, televised college football was a significant source of income for the NCAA. If the television contracts the NCAA had with ABC, CBS, and ESPN had remained in effect for the 1984 season, they would have generated US$73.6 million for the Association and its members. In September 1981, the Board of Regents of the University of Oklahoma and the University of Georgia Athletic Association filed suit against the NCAA in district court in Oklahoma . The plaintiffs stated that the NCAA's football television plan constituted price fixing, output restraints, boycott, and monopolizing, all of which were illegal under the Sherman Act. The NCAA argued that its pro-competitive and non-commercial justifications for the plan—-protection of live gate, maintenance of competitive balance among NCAA member institutions and creation of a more attractive "product" to compete with other forms of entertainment—-combined to make the plan reasonable. In September 1982, the district court found in favor of the plaintiffs, ruling that the plan violated antitrust laws. It enjoined the Association from enforcing the contract. The NCAA's legislative structure is broken down into cabinets and committees, consisting of various representatives of its member schools. These may be broken down further into sub-committees. Legislation is then passed on to the Management Council, which oversees all the cabinets and committees, and also includes representatives from the schools, such as athletic directors and faculty advisors. Management Council legislation goes on to the Board of Directors, which consists of school presidents, for final approval. The NCAA staff itself provides support, acting as guides, liaison, research and public and media relations. Former Indiana University president Myles Brand was the most recent head of the NCAA. In the wake of his death, executives with the organization will oversee day-to-day operations until the Executive Committee names Brand's successor. Sports sanctioned by the NCAA include basketball, baseball (men), softball (women), football (men), cross country, field hockey (women), bowling (women), golf, fencing (coeducational), lacrosse, soccer, gymnastics, rowing (women only), volleyball, ice hockey, water polo, rifle (coeducational), tennis, skiing (coeducational), track and field, swimming and diving, and wrestling (men). The NCAA is not the only collegiate athletic organization in the United States. Several other such organizations exist, with the largest being the National Association of Intercollegiate Athletics . The Canadian equivalent to NCAA is the Canadian Interuniversity Sport (CIS). Presently, UCLA, Stanford and Southern California have the most NCAA championships; UCLA holds the most, winning a combined 104 team championships in men's and women's sports, with Stanford coming in second with 97. The NCAA currently awards 87 national championships yearly; 44 women's, 40 men's, and three coed championships where men and women compete together (Fencing, Rifle, and Skiing). 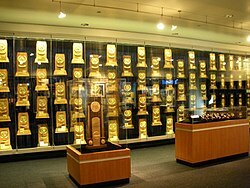 For every NCAA sanctioned sport other than Division I FBS football, the NCAA awards wooden trophies with gold, silver, and bronze plating for the first, second, and third place teams respectively; similar to the Olympics. In the case of the NCAA basketball tournaments, both semifinalists who did not make the championship game receive bronze plated trophies for third place (prior to 1982 the teams played a "consolation" game to determine third place). Similar trophies are awarded to both semifinalists in the NCAA football tournaments (which are conducted in Division I FCS and both lower divisions), which have never had a third-place game. Winning teams maintain permanent possession of these trophies unless it is later found that they were won via serious rules violations. Starting with the 2001 season, and later in 2008, the trophies were given an extensive facelift. Starting in the 2007 basketball season, teams that make the Final Four in the Division I tournament receive bronze plated "regional championship" trophies upon winning their Regional Championship. The teams that make the National Championship game receive an additional trophy that is gold plated for the winner and silver plated for the runner-up. Starting in the mid-1990s, the National Champions in men's and women's basketball receive a very elaborate trophy sponsored by Siemens with a black marble base and crystal "neck" with a removable crystal basketball following the presentation of the standard NCAA Championship trophy. The NCAA does not hold a championship tournament for Division I FBS football, which has caused controversy. In the past, the "national championship" went to teams that placed first in any of a number of season-ending media polls, most notable the AP Poll of writers and the Coaches Poll. Currently, the Bowl Championship Series—an association of the conferences who compete in Division I FBS and four bowl games—has arranged to place the top two teams (based on a formula blending human polls, computer rankings, and, in some years, other factors, such as national notabilty, as seen with Boise State in 2006, as Boise State went undefeated, and did not make it to the national championship) into a national title game. The winner of the BCS title game must be ranked first in the final Coaches' Poll and receives the ADT Trophy; since the NCAA awards no national championship for Division I FBS football, this trophy does not say NCAA as all other college sports national championship trophies do. The AP and other organizations are still free to name as national champions other teams than the one that won the BCS championship. Conferences with automatic entry to the Bowl Championship Series are denoted with an asterisk (*).Conferences within the Football Bowl Subdivision but not the BCS are denoted with a pound sign (#). Theodore Roosevelt Award , the highest honor that the NCAA confers on an individual. On or about March 1, 2008, the NCAA launched its revamped website with the address NCAA.com, changed from NCAASports.com. The site offers streamlined navigation and a quick reference to many popular links at the bottom of each page. On March 16, 2009, the NCAA announced a partnership with Replay Photos and the Associated Press to create the NCAA Photo Store website with the address www.replayphotos.com/ncaaphotostore. The site updates photos from NCAA events as they are taken and makes them immediately available for sale. The site offers pictures of all 88 NCAA Championships across all three divisions. To participate in college athletics in the freshmen year the National Collegiate Athletic Association (NCAA) states that students must meet three requirements; graduate from high school, complete the minimum required academic courses, and have qualifying grade-point average (GPA) and SAT or ACT scores (Hishinuma and Fremstad 589-591). The 16 academic credits are four courses in English, two courses in math, two classes in social science, two in natural or physical science, and one additional course in English, math natural or physical science or another academic course such as foreign language (2009-2010 Guide for the College Bound Athletes). To meet the requirements for grade point average and SAT scores students the lowest possible GPA a student may be eligible with is a 2.000 with an SAT score of 900. The lowest SAT score a student may be eligible with is 700 with a GPA of 2.500(Hishinuma and Fremstad 589-591). Institutions violating the probationary period may be subject to being banned from participating in the sport in question for up to two years, a penalty known as the "Death Penalty". This penalty has only been imposed three times in its modern form, most notably when Southern Methodist University 's football team had its 1987 season canceled due to massive rules violations dating back more than a decade. SMU opted not to field a team in 1988 as well due to the aftershocks from the sanctions, and the program has never recovered. This has reportedly made the NCAA skittish about issuing another one. Since the SMU case, there are only three instances where it has seriously considered imposing it against a Division I school; it imposed it against Division II Morehouse College 's men's soccer team in 2003 and Division III MacMurray College's men's tennis team in 2005. Additionally, in particularly egregious cases of rules violations, coaches, athletic directors and athletic support staff can be barred from working for any NCAA member school without permission from the NCAA. This procedure is known as a "show-cause order" (not to be confused with an order to show cause in the legal sense). Theoretically, a school can hire someone with a "show cause" on their record during the time the show cause order is in effect only with permission from the NCAA Infractions Committee. The school assumes the risks and stigma of hiring such a person. It may then end up being sanctioned by the NCAA and the Infractions Committee for their choice, possibly losing athletic scholarships, revenue from schools who would not want to compete with that other school, and the ability for their games to be televised, along with restrictions on recruitment and practicing times. As a result, a show-cause order usually has the effect of blackballing individuals from being hired for the duration of the order. Currently, Dave Bliss, former basketball coach at Baylor University , has the longest show cause order. As a result of his involvement in serious rules violations, Bliss is effectively banned from coaching at the major college level until the 2015-16 season. The NCAA also has the power to declare players ineligible. In extreme cases, a player can be banned from competing for any NCAA member school. The only known instance where this has happened was in 1989, when Kentucky Wildcats basketball player Eric Manuel was banned after the NCAA ruled he had cheated on a college entrance exam. AT&T, Coca-Cola and GM are NCAA Corporate Champions. Other sponsors are NCAA Corporate Partners. Student-athletes at universities with major athletic programs often have low graduation rates.